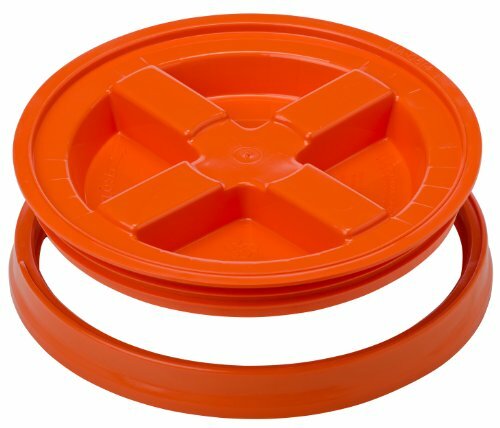 Gamma Seal lids are a pretty cool idea – they were invented to make access to your 5 or 7 gallon bucket less painful to open and close. You know that feeling of pulling on the lid and thinking if this gives way, I’m doing to bend my nails? And then of course, what happens? It gives way, and your fingernails get bent backwards or worse! With a Gamma Seal lid that will never happen again. 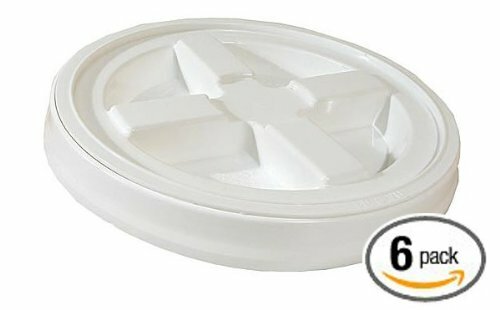 Simply put, the Gamma Seal lids turn any old plastic bucket into great food storage containers for survival food, freeze dried food, long term food storage or really storage of any kind. 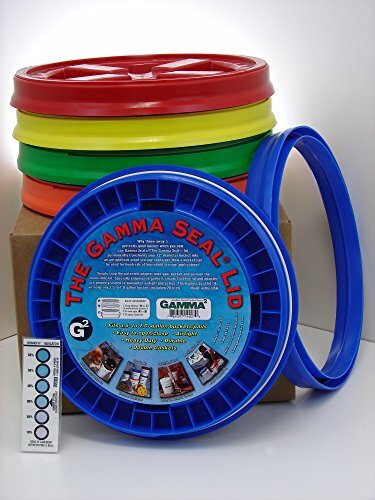 Gamma Seal Lids are a patented idea that comes with 2 pieces – a clip-on ring, and a screw on cap. Simply put, the clip on piece allows you to easily screw the other piece off and on over and over again. As the two pieces come together, there’s a flexible rubber seal that makes it a waterproof and airtight seal. People use them for all sorts of things – from making beer and soap at home, to storing greasy automotive items. Fisherman use them to keep their items dry, or to store minnows in that keeps them from splashing and floats should it go overboard! For picnics and family outings, it works as a leak-proof cooler for ice and drinks and it doubles as a seat. If you have a large bucket of paint, snap on a gamma lid for an airtight seal that keeps pain from spilling. In the restaurant industry, Gamma lids quickly spin off and on and they can increase productivity and reduce spillage. They also work great for storing dog and cat food, and other animal feed in an airtight, dry container. For my family, we decided to get a bunch of them so that we can store all of our large bags of flour and rice in the pantry without fear of pantry moths getting to them (long story, but from a bad experience a few years ago we basically through away our pantry full of food). Before purchasing, I searched all over the internet and found a few sites claiming to sell the Gamma Lids Wholesale for a cheap price. Really, after shipping costs, they were basically on par with Amazon’s prices. I just bought them through Amazon so I didn’t have to create a new account, enter my credit card info and address, or worry about the reliability and shipping speed of the random site I happened across on the internet. For color coding your storage buckets, you can buy singles of any of 6 different colors. For all the colors of the rainbow, check out the bulk pricing on this 5 pack. It includes a red gamma lid, green gamma lid, blue gamma lid, yellow gamma lid, and an orange gamma lid. They’re slightly more expensive than the plain white twist on bucket lids, but they’re way more fun! If you aren’t picky about color, buying a 6-pack of white lids is the cheapest way to get in the bucket re-using game. Gamma seal lids are BPA free. The raw material used in manufacturing is Formolene LH5206, High Density Polyethylene (HDPE). Formolene LH5206 meets all requirements of the U.S. Food and Drug Administration as specified in 21CFR 177.1520, covering safe use of polyolefin articles intended for direct food contact. The gaskets for the lid and the adapter are made from SBR (styrene-butadiene Rubber copolymer) and coated with an FDA approved silicone lubricant. The pigments used in manufacturing are heavy metal free. For storing food, you of course want to make sure the plastic bucket you are putting the food in is safe. Even if the food (like Flour) will still stay in the paper bags, it doesn’t hurt to make sure the bucket doesn’t contain BPAs or other harmful chemicals. Now all you have to do is find a bucket! For a while, Lowes was selling Food Grade 5 gallon pails (with their logo of course) for $3.99. They don’t have them listed on their website anymore so I don’t know if you could still find them in store. Another great source for food grade buckets is to buy used ones off of Craigslist. On my local listing, there is a food company that has a whole stack of them that are leftover from Olives and other food that was shipped to them from overseas. They are selling them for $2 each and they need to be cleaned…. not too bad! Gamma seal lids come in a few different sizes. They come in a 12″ size that fits standard 3 gallon, 5 gallon, and 7 gallon buckets, and also a smaller size that fits 2 gallon buckets. How Are Gamma Seal Lids Made? Check out this YouTube Video. A large machine has hot, melted, food grade plastic pumped into it and forced into a mold. The plastic is cooled, and the gamma lid and sealing ring are popped out of the machine. Some bulk foods like oats, grains, and rice can become infected with bug eggs even when using sealed lids. It’s unclear whether this person encountered this because the bulk foods came with eggs in it (that hatched after long periods of sitting unused), or if the bugs got in and then were sealed in. You simply can’t let food sit opened (even though it’s in a “sealed” bucket) for years and that’s by and large what we’ve been doing. Sure, we get into these foods on occasion but I don’t think I’ve had to add any rice or oats or beans to any of these buckets in years which is a clear sign we’re not using our bulk foods very much anymore. Some comments on that page give helpful reminders that you need to store what you use, and USE WHAT YOU STORE. If you refill the gamma-sealed lid from the factory sealed buckets or containers, that should minimize the possibility of eggs or larvae hatching in your food supply.